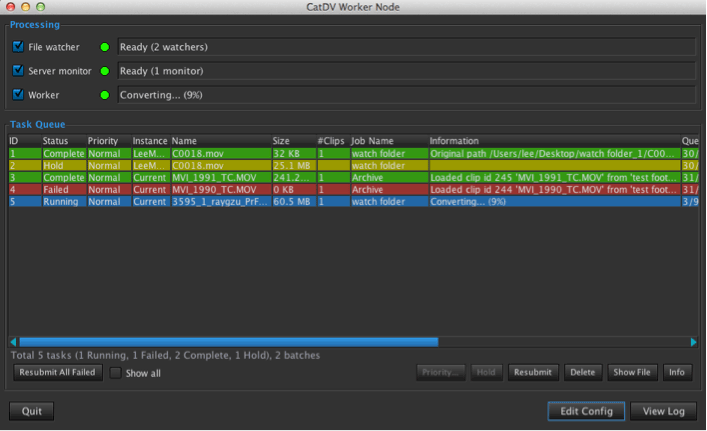 The CatDV Worker Node is a powerful automation engine that can transform media workflows. Its capabilities are nearly infinite, and including media ingest and transcode, enforcement of naming and filing standards and integration with third party systems. The Worker is an automated version of the media processing engine found in the CatDV Pro application. It has two main components, the file watcher that watches one or more watch folders looking for new files to process, and the worker, a background thread which waits for and then processes the next available item from a queue of tasks.